COLUMBUS, Ohio — The Huskies are back in the NCAA tournament for the first time since 2011. Washington is a No. 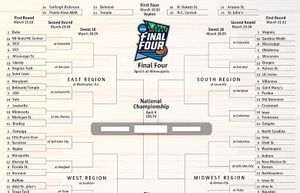 9 seed in the Midwest region with a first-round game 3:50 p.m. Friday on TNT against No. 8 Utah State at Nationwide Arena. 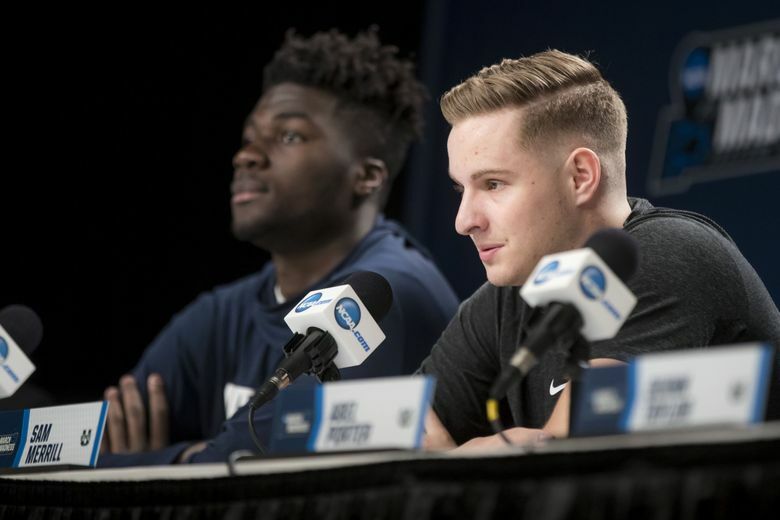 Most experts consider the matchup between the Huskies (26-8) and Aggies (28-6) as a coin-flip because of the many similarities between the teams. Both teams dominated their conference — UW in the Pac-12 and USU in the Mountain West. 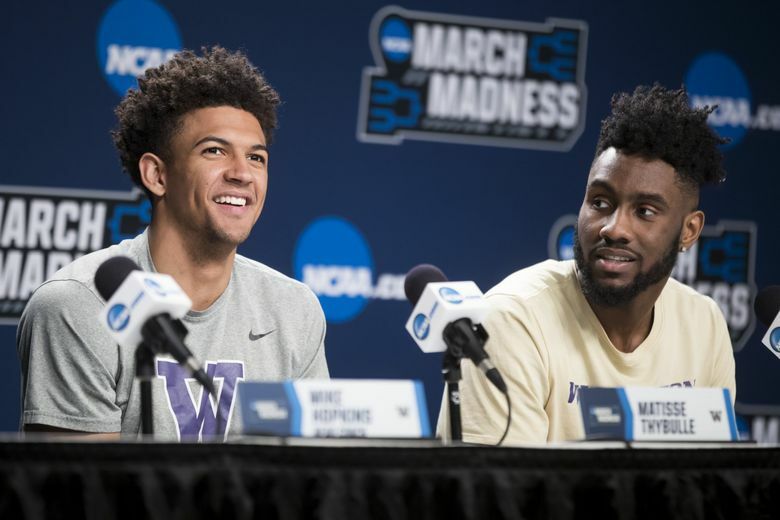 Each squad racked up a slew of conference awards, including player of the year (Jaylen Nowell and Sam Merrill), defensive player of the year (Matisse Thybulle and Neemias Queta) and coach of the year (Mike Hopkins and Craig Smith). Fivethirtyeight.com gives UW a 49-percent chance to win and the Huskies are a three-point underdog, according to the Westgate SuperBook in Las Vegas. Here’s a look at some keys for the Huskies on Friday. 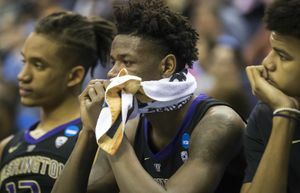 Washington looks to rebound from last Saturday’s 68-48 defeat to Oregon in the Pac-12 Tournament title game. It was the fewest points for the Huskies this season. Midway through the season, Washington won 15 of 16 games and ran away with the Pac-12 regular-season title. Since then, Washington is 3-4. Utah State is one of the hottest teams in the country, winning 17 of its last 18 games. The Aggies, the Mountain West regular-season co-champion and tournament champion, have a 10-game winning streak. The 6-5 junior guard has led Utah State in scoring in 26 of 34 games. He averages 21.2 points while shooting 46.5 percent from the field, 37.8 on three-pointers and 90.7 at the free-throw line. Merrill also averages 4.2 assists and 4.0 rebounds. Merrill is capable of a big scoring night. He tallied 38, 37, 35 and 32 points this season. 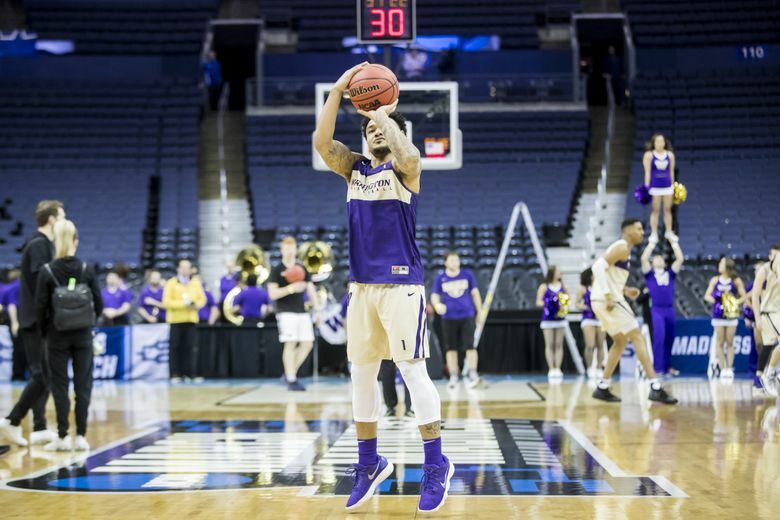 The 6-4 sophomore guard led UW in scoring with 16.0 points per game while shooting 45 percent from the field, 35.1 percent on three-pointers and 80 percent at the line. He had a streak of 16 double-figure scoring games snapped Saturday with an eight-point outing against Oregon. Nowell also averages 5.3 rebounds and 3.1 assists. His name is pronounced nuh-Mee-ish Kay-ta. The 19-year-old Barreiro, Portugal, native began playing basketball five years ago. The 6-11 and 240-pound freshman has a 7-4 wingspan. Queta ranks eighth among Division I players with 82 blocks. He averages 11.9 points, 8.9 rebounds and 2.4 blocks. He shoots 62.7 percent from the field and just 56 percent on free throws. It’s been a record-breaking season for the 6-5 senior who passed Gary Payton for the all-time Pac-12 steals record (322) and eclipsed Jason Kidd for the conference’s single-season steals record at 117. Thybulle also has 77 blocks and is a semifinalist for the Naismith national defensive player of the year award. Thybulle averages 9.3 points, 3.1 rebounds, 2.1 assists, 3.4 steals and 2.3 blocks. Can UW make perimeter shots? The Huskies are 15-4 this season when David Crisp makes at least two three-pointers. They’re also 13-4 when Dominic Green hits at least two shots behind the arc. Generally speaking, Washington plays good defense on most nights, but the offense has been wildly inconsistent. When the Huskies bring their offense, particularly their perimeter attack, they’re virtually unbeatable. 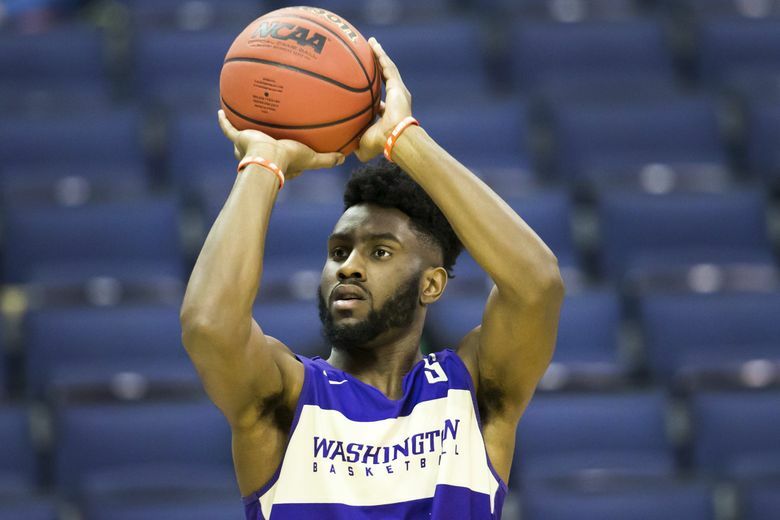 Washington, which averages 7.5 three-pointers per game, is 12-4 when it makes at least eight three-pointers. 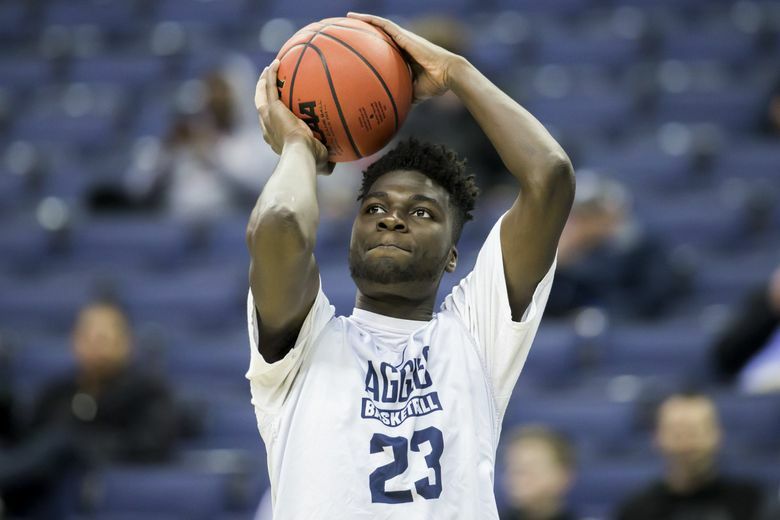 It’s going to be interesting to see how Utah State defends Dickerson, who is riding a three-game scoring slump in which he’s averaging just 5.0 points. That’s down more than seven points from his 12.2 season average. During his slump, Dickerson has had more turnovers (nine) than field goals (six). The Huskies can’t afford their best low-post scorer to be a no-show once again on the offensive end. Washington also needs Dickerson to continue his torrential rebounding pace — he’s averaging 12.6 boards in the last five games. Washington can disrupt Utah State’s offense and force a slew of turnovers. USU averages 17.2 assists and just 12.5 turnovers. The Huskies will need to flip those numbers to slow down the Aggies’ prolific scoring attack. UW also needs to get to the free-throw line. The Huskies attempted just eight free throws in their last outing. That’s not going to cut it against the Aggies. Utah State scores more than 80 points. The Aggies aren’t used to playing low-scoring games. They’ve been held to fewer than 70 points just six times while UW has allowed more than 70 points just nine times. Arizona State beat Utah State 87-82 on Nov. 21, but Washington doesn’t have the firepower to win a high-scoring game against the Aggies. This game will be decided by which team is able to impose their will. The Huskies will want to make it a defensive battle and the Aggies prefer a high-scoring affair. 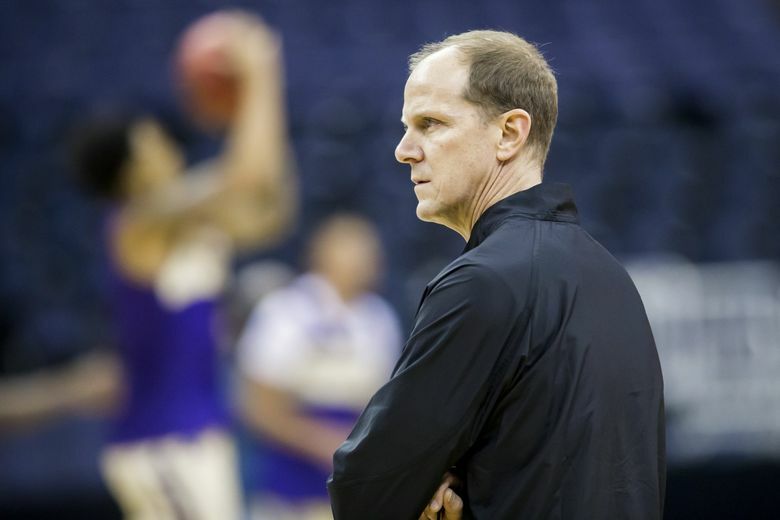 UW figures out to slow down Merrill and force USU’s supporting cast to make shots. The Huskies have more weapons if the stars falter.